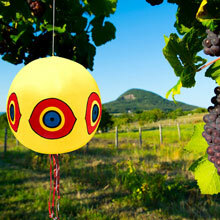 These scare balloons imitate the glaring eyes and gaping mouths of predator birds to tap into a birds' instinctive fear. 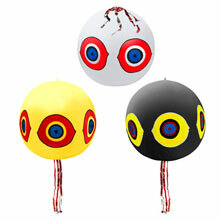 The bright colors, holographic eyes and reflective streamer on these inflatable balloons will effectively and environmentally repel birds within visible range. 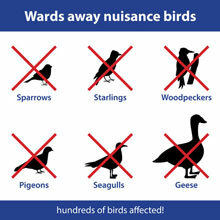 Repels most common household birds including woodpeckers, pigeons, herons, grackles, crows, starlings, seagulls, wild ducks and geese. 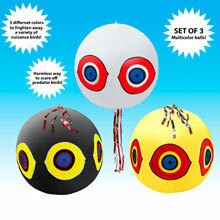 Each pack includes 3 balloons, with 9 ribbons, 3 hanging strings and 18 reflective eye stickers. 13" dia. balloon, 17" long ribbon, 17" long hanging strings. This product is not a toy and contains small parts. 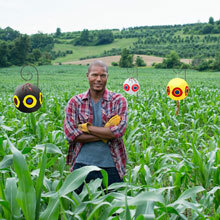 Not to be handled by children. 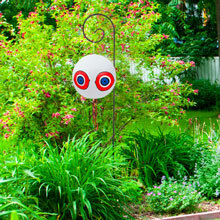 •PRACTICAL DESIGN: Prevents birds from setting up home in your gardens, carports, boat docks or fruit trees, perfect method to protect your home, car, boat and crops from nesting, corrosive bird dropping and other damage that they can inflict, save time and money on cleanups and repairs. •DURABLE MATERIALS: Strong durable PVC is used to create these long lasting bird repellents, each pack comes with 3 different color balloons, 9 ribbons, 3 hanging string and 18 reflective eye stickers, 13" dia. balloon, 17" long ribbon, 17" long hanging strings. 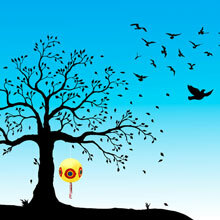 •EASY TO USE BIRD REPELLENT: Simply inflate, apply eye sticker and hang this bird scarcer on tree branches or any area you want to protect with access to wind and light, the combination of reflective predator eyes, ribbon, bright colors and wind movement intimidates and repels birds. 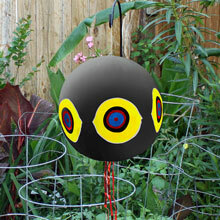 •MULTI PURPOSE: Efficiently repel a number of common pest birds including pigeons, sparrows, starlings, swallows, crows, blackbirds, geese, seagulls, ducks, and woodpeckers, can also float in water to scare away birds and wild ducks and geese to keep your lake or swimming pool free of flying pests. •ECO-FRIENDLY: Non-toxic solution to pest control, wildlife friendly and completely harmless to birds and pests, but a perfect solution in preventing damage and disease to your gardens, yards, swimming pools or crops.